The recycling of metals has a number of benefits. Not only does it have a huge positive impact on the environment, it also does a great deal to help the economy. Are you interested in metal recycling in Chicago? The truth of the matter is that there are recyclable metal items in every household. Not sure if you have any metal items that can be recycled? Here are 9 metal household items that you can recycle. If you’ve ever owned an automobile (and you likely have), you’re bound to have old car components laying around your house or garage. These components are often made out of a variety of different metals, from iron, to stainless steel, to aluminum, and more. Each and every one of them can be melted down and recycled. As you probably already know, food cans can be easily recycled. Made out of steel, they can typically just be thrown into a municipal recycling bin. Maybe you have an old weight bench that no longer sees any use? Perhaps you’ve got some dumbbells that haven’t been touched in years? In any case, if you have metal exercise equipment in your possession, it can be recycled. Probably the most recycled metal object is the soda can. In most municipalities, sodas cans are extremely easy to recycle. All you have to do is throw them in a recycling bin, and wait for them to be taken away. You might be surprised to hear that aluminum wrap can actually be recycled. Just make sure that, before tossing it in your recycling bin, it’s as clean as possible. If it’s covered in food residue, it can’t be put through the recycling process. Another household item that can be recycled is bicycles. Almost every home in the United States has old bikes stored away somewhere. 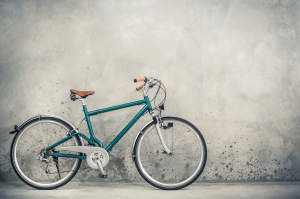 If these bikes are made out of a metal such as aluminum or steel, they can be recycled. In some cases, bicycle parts can be reworked to create new bicycles. In other cases, these parts will have to be melted down so that they can create new parts altogether. These days, TVs seem to be a dime a dozen. For this reason, we almost all have old TVs laying around our homes. While not every part of these TVs can be recycled, many of the internal components often can. If you’d like to recycle them, you’ll have to remove them from the inside of the TV and take them to a metal recycling warehouse. As with TVs, the internal components of refrigerators can be recycled. It’s recommended that you take them out yourself before taking them to a metal recycling company. While small metal items can typically be picked up from curbsides by municipalities, large metal items typically can’t. Therefore, if you’re trying to recycle refrigerator parts, car parts, exercise equipment, or some other type of large metal item, you’ll have to work with a recycling company. Looking to do business with a metal recycling company in Chicago? Central Metal Recycling is the company to call.